We are a village WI founded in 1962 and currently have around 30 members. The speakers at our monthly meetings cover a wide range of interesting topics and our members particularly enjoy food demonstrations. Meals out at local venues are arranged and we join in the many village activities available. There is no need for separate clubs within our WI as the village has them in abundance. Our WI is called upon to help with the refreshments at the village festival and we take part in the church Christmas Tree Festival. 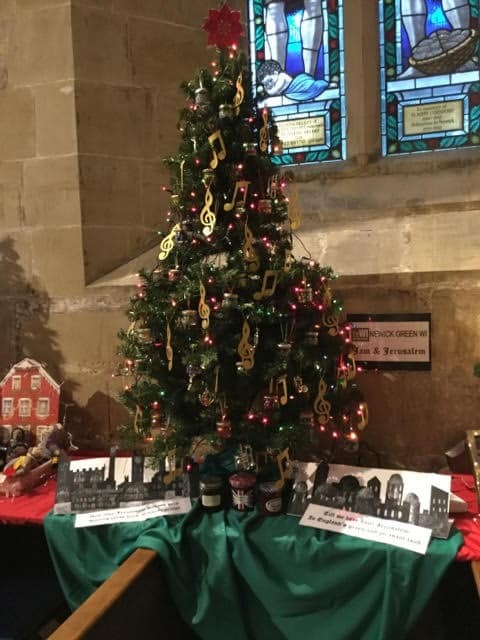 This year our Christmas Tree was themed as Jam and Jerusalem, with small decorated jam pots and music notes, also pictures and the words to depict the tune of ‘Jerusalem’. It was very well received by everyone.